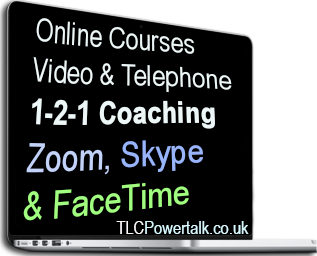 Our E-Coaching and Online Courses are delivered one to one via Skype Video Calls, Facetime Calls; or if you prefer, Telephone Coaching & Email. We recommend that for the Public Speaking & Presentation Skills sessions, you choose to have Video Coaching. We recommend video coaching for these sessions because it is important to have visual access in order to carry out some of the exercises. "I was a bit apprehensive to start but I soon realised that they were very worthwhile. The sessions online were just as good as they would have been in person. The video calls were clear, focused and communication was excellent. I would recommend the video sessions to anyone. Getting trained in the comfort of your own home is brilliant." E-Coaching is a virtual coaching session delivered via the Internet to almost anywhere in the world. This E-Coaching is delivered in English, via Skype Video, Facetime and Email. You email or call and arrange a free telephone consultation in order to discuss your requirements. We will then include elements in the session that will enable you to get the best results. Can I vary the content of each session? Yes - The sessions are bespoke and tailored to suit your desired outcome. You can also include Personal Development in a Public Speaking session. How much will I learn in an hour? How much you learn is really up to you. You will definitely be more enlightened and take away best practice techniques and tips from every session. We recommend at least 2 sessions for more extensive learning and in depth Coaching. Do I require special equipment for this E-Coaching? All that is required is that you download and have access to Skype video calls or Facetime video calls on your computer or mobile device. Both programs are free to download and easy to use. When requested to do so, you will then add us to your Skype Contact list. Will I receive help on how to work these programs? Yes. If requested, you can receive instructions over the telephone before the session officially starts. What happens during a session? How does it work? You will be coached by Terry Neason via video calls. These calls are the next best thing to actual face to face Coaching. This is interactive video coaching and you will practice during the session. After each session you will be emailed a worksheet with notes. Video E-Coaching is an effective and convenient way to have Terry as your personal Coach in the comfort of your own home, at the office, or on the move. Depends on how many sessions. We also give special rates to our regular Clients. Contact us to discuss your requirements.